Thomas from Ireland continued his Thailand stingray fishing holiday with another day at the Maeklong River. After previously landing several Giant freshwater stingrays at the Maeklong River to a whopping estimated 200kgs the angler fished his final day on the river. With conditions looking good for a take or two floats were deployed in the river ready for action. After a few hours had passed one of the floats burst into life and began steadily moving off downstream. On winding into the unseen Giant freshwater stingray the rod was violently pulled down and battle commenced. The Giant freshwater stingray was clearly a big specimen easily shifting the boat around in the water. Thomas piled on the pressure from above for over an hour with the stingray regularly clamping onto the riverbed in an attempt to evade capture. The fight went through the hour mark and continued for almost an hour before the Irish angler finally managed to get the Giant freshwater stingray into mid water. The Giant freshwater stingray could be seen gliding gracefully under the surface as it was slowly and carefully brought up to the net. On netting the stingray wildly thrashed its tail before being tied off against the side of the boat. 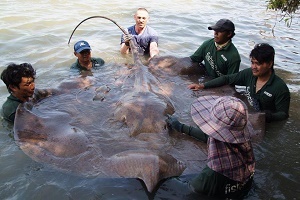 On arriving at the riverside the anglers unfurled the net to reveal a monster sized Giant freshwater stingray estimated to weigh possibly 250kg’s. Amazingly the Giant freshwater stingray had given birth whilst in the net to a perfectly formed miniature stingray. The stingray was quickly photographed before being released back into the tidal river with its newborn.